Donna Huanca, Cuban Rebels (The Last Supper), 2007, fabric on canvas, 8’ 4” x 11’ 7”. In this group exhibition, curator Peregrine Honig channels the historically romanticized American cowboy, positioning him as one who mounts but never rides. John Woods’s three-hundred-pound Marbles and Coins from MacArthur Park, 2008, is the show’s literal and symbolic anchor. The artist frames this thrift store landscape painting of the MacArthur Park Lake in Los Angeles with marbles and covers it in pennies that were fished from the actual lake by hired laborers. Jack Daws’s Life on the Farm (Butterfield), 2010, utilizes a David Rees–esque repetitive comic style to poke fun at the idea of a working-class farmer desiring to become a video artist. A similar failure of destiny manifested is evoked in Terry Allen’s Bottom of the World, 2013—his first music album in fourteen years, which appears here with a suite of eleven lithographs of sheet music—in which he hums about his dog getting shot and the real estate market crash. But the true meat of this show occurs in a work that bucks the cowboy’s assumed whiteness and cis male gender. 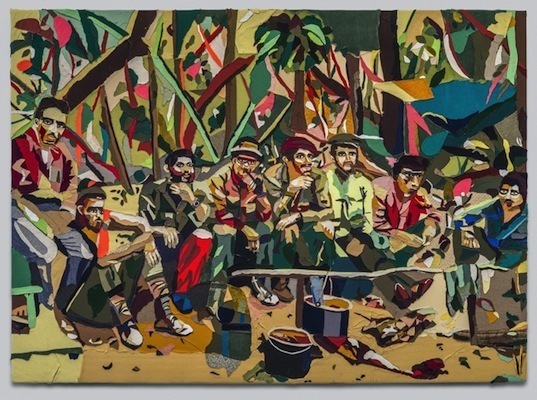 In Cuban Rebels (The Last Supper), 2007, Donna Huanca uses scraps of her father’s old clothing to shred the commoditized image of rebel/hero Che Guevara, reconstituting a photograph of the rebel/hero and his crew in the Bolivian jungle as a large-scale collage—a softened approach toward a fabricated memorial to this branded Marxist revolutionary. Similarly, Sarah Xeno takes down the hypermasculinized with her delicate and thus unusable gold and copper Gilded Gloves, 2013. In Adriane Herman’s wood panels Workout at 8:20, Trash, Rent, Meat/Bank, and Arms Movies (all 2013), the artist enlarges scribbles from her former studio assistant’s FTM transition to-do lists, which show him checking off the items that will grant him physical masculinity. The real cowboy emerges as an underpaid gender-nonspecific laborer performing monotonous work in uncharted territories, their horse nowhere to be found.